William Wallace was victorious at the battle of Stirling Bridge. However, his co-commander Andrew Murray died soon afterward, leaving Wallace alone as Guardian of the Kingdom to face a superior English force under Edward I himself at the battle of Falkirk in 1298. He lost. His credibility ruined, Wallace resigned the Guardianship, but did not give up the fight. He never surrendered to Edward and Edward always excepted him from any offers of clemency. Having served Scotland abroad by diplomacy in France, Wallace returned to Scotland. 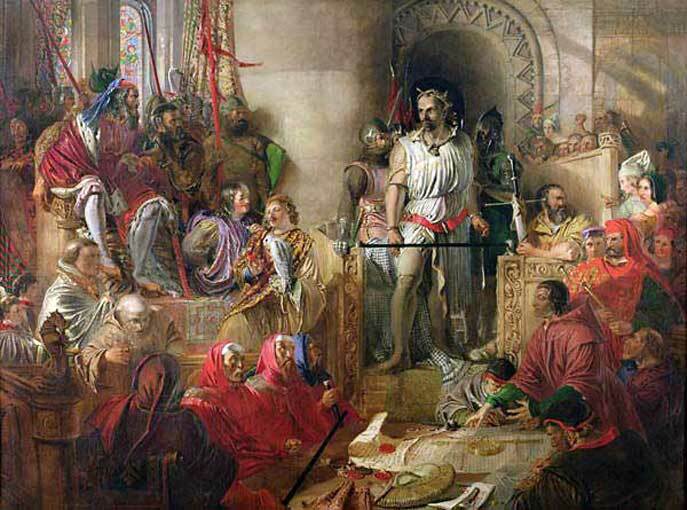 On 3 August 1305 he was betrayed to the English and captured. On 23 August he was executed. What follows comes from an 18th-century transcript of a medieval manuscript from the Sir Robert Cotton collection, which was lost in a fire in 1731. It is a contemporary record of Wallace's 'trial' and sentence in London before an English court acting on behalf of a king whose authority Wallace never recognised. It is a translation from the original Latin. William Wallace, a Scot, and born in Scotland, a prisoner for sedition, homicides, plunderings, fire-raisings, and diverse other felonies came and, after the same justices had read out how the aforesaid lord the King had in hostile manner conquered the land of Scotland over John Balliol, the prelates, the earls, the barons and other enemies of his of the same land, in forfeiture of the same John, and by the conquest of him had submitted and subjugated all the Scots to right of ownership and his royal power as their King, he had received in public the homages and pledges of the prelates, the earls, the barons and very many others, and he had made his peace to be proclaimed throughout the whole of the land of Scotland. He had appointed and set up the Guardians of that land, appointing the sheriffs, the provosts, the bailies and other ministers of his, in his place, to maintain his peace and give justice to all whomsoever according to the laws and customs of that land. The aforesaid William Wallace, forgetful of his fealty and allegiance, raised up all he could by felony and premeditated sedition against the same lord the King, having united and joined to himself an immense number of felons, and he feloniously invaded, and attacked the Guardians and ministers of the same King, feloniously and against the same lord the King's peace, insulted, wounded and killed William de Heselrigg, sheriff of Lanark, who the appointments of the said King in the regular meeting of the county court, and afterwards in contempt of the same king without reason fought against the same sheriff whom he had killed. He feloniously and seditiously slaughtered religious men and monks dedicated to God, and burnt and laid waste churches constructed for the honour of God and the saints, together with the bodies of the saints and other relics of them that had been honourably collected therein; he spared no-one who spoke the English language, but afflicted all, old men and youths, wives and widows, children and babes in arms with a more grievous death than could be considered. And so, every day and every hour, he seditiously and feloniously persisted in contriving the death of the same lord the King, and the destruction and the manifest weakening of the crown and his royal majesty. And it is clear that after such outrageous and horrible deeds, the aforesaid lord the King, together with his great army, had invaded the land of Scotland and had defeated the aforesaid William, who was bearing his standard against him in mortal warfare, and other enemies of his, and had granted his true peace to all from that land and had mercifully taken the aforesaid William Wallace back into his peace, the said William seditiously and feloniously, whole-heartedly and undauntedly persevering in his above noted wickedness, disdained to submit himself to the aforesaid lord King's peace and to come forth to it, and so was publicly outlawed in the court of the same lord the King as traitor, robber and felon, according to the laws and customs of England and Scotland. It is clearly both unjust and in disagreement with English laws and it is held true that anyone thus outlawed and placed outside the laws and not afterwards restored to his peace, is committed to the forfeiture of his own status or accountability. It is considered that the aforesaid William, for the open sedition which he had made to the same lord the King by felonious contriving, by trying to bring about his death, the destruction and weakening of the crown and of his royal authority and by bringing his standard against his liege lord in war to the death, should be taken away to the palace of Westminster as far as the Tower of London, and from the Tower as far as Allegate [Aldgate], and thus through the middle of the city as far as Elmes, and for the robberies, murders and felonies which he carried out in the kingdom of England and the land of Scotland he should be hanged there and afterwards drawn. And because he had been outlawed and not afterwards restored to the King's peace, he should be beheaded and decapitated. And afterwards for the measureless wickedness which he did to God and to the most Holy Church by burning churches, vessels and shrines, in which the body of Christ and the bodies of the saints and relics of the same were wont to be placed together, the heart, liver, and lung and all the internal [parts] of the same William, by which such evil thoughts proceeded, should be dispatched to the fire and burned. And also because he had committed both murders and felonies, not only to the lord the King himself but to the entire people of England and Scotland, the body of that William should be cut up and divided and cut up into four quarters, and that the head thus cut off should be affixed upon London bridge in the sight of those crossing both by land and by water, and one quarter should be hung on the gibbet at Newcastle upon Tyne, another quarter at Berwick, a third quarter at Stirling, and a fourth quarter at St John's town [Perth] as a cause of fear and chastisement of all going past and looking upon these things &c.